January 5, 2014 - Stuart Scott, longtime ESPN anchor known for his unique broadcasting style and popular catchphrases, died on January 4 after a lengthy battle with cancer. He was 49. A Chicago native and UNC alum, Scott joined ESPN in 1993 for the launch of ESPN 2, and quickly gave the station an identity as a cooler, hipper place to get the day’s sports news. Scott soon outgrew the fledgling network and moved over to ESPN where his star continued to rise. 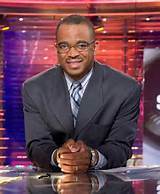 He became a staple on SportsCenter and hosted NFL “Monday Night Countdown,” “NBA on ESPN” covered the NBA Finals for nearly 20 years and interviewed presidential hopeful Barack Obama during his 2008 campaign. Scott was first diagnosed with cancer in 2007 after an emergency appendectomy. During his treatments and reoccurences in 2011 and 2013, he always maintained a strong work ethic and dedication to the job that he loved, only missing time in Bristol on treatment days, which was every other Monday. At the 2014 ESPY's, Scott received the Jimmy V Award for Perseverance and reiterated his positive outlook to the crowd. "When you die, it does not mean that you lose to cancer," Scott said. "You beat cancer by how you live, why you live, and in the manner in which you live."